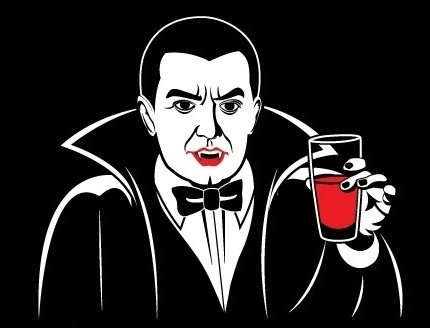 A toast to the 36 fangtastic folks who attended the V. Day Soiree! I was blown away by all the love and support I/the event received. Now that I know others are into it, I'll definitely do it again next year. I also want to let you know that I read and enjoyed all of your posts! Please email me your address and I'll pass it on to BaronBob. Anyway, I've decided to switch the subject from immortality to insanity. was seeing Emilie Autumn in Maryland last Friday! The Asylum experience is what I hope to recreate here. So I hereby decree, March (and the end of Feb.) will be Madness Month! And yes, we shall have a Mad Tea Party! We can't have a Mad Tea Party without a Mad Hatter though! Are you mad enough for the job? Find out how to apply here. You can also enter a nutty giveaway going on here! good times it was... congrats to the winner. i hope there will be a next year... zombies and vampires we made a good pair. Indeed! And yep, vampires and zombies make a perfect pair! Speaking of zombies, I'll be entering your ghoul giveaway soon! please do... it has only one week left.. and thank you. I can't find your email address to email you my address? Got your email! I'll let you know when the goodies are on the way. Let me know how the bacon floss is btw. And you're very welcome! Thanks for entering and being a part of the Soiree! You were at the concert as well? That excellent, so was I. Really?! I wish I knew you were going. We could've met up! Sounds like a fun time was had by all. I wish I had more time to visit with everyone, but I did meet some great peeps. Jeremy being one of my winners of a copy of my book during the Soiree! I'll definitely be looking forward to seeing this next year! Yes! :) I just wish I had more time to visit with everyone too. I would've entered your giveaway. I'm glad Jeremy won though! It was awesome! Thanks for creating the event. I'd love to have you be part of the Tea Party! You can find out how to enter to be Mad Hattress here! No worries! I'm always late to the fair too. And thank you! :D I'm looking forward to your event. Vampire's Day Soiree and Giveaway!